ATHENS, Greece Greece's Piraeus Bank was chosen Friday to buy two Cypriot banks' operations in Greece, part of the Mediterranean island's plan to avoid bankruptcy and a potential exit from the eurozone. Statements by Piraeus and the Hellenic Financial Stability Fund gave no detail about the deal involving the Greek units of the Bank of Cyprus and Laiki Bank. A pledge to back the sale was announced hours earlier between the Greek and Cypriot governments. The acquisition is subject to approval by the European Union's Directorate General for Competition, the HFSF said. Friday's move had been stalled for days after Cypriot lawmakers voted against an international bailout plan that would have imposed a levy on people's bank deposits. Cypriot officials are scrambling to complete an alternative rescue plan and present it to other eurozone countries. The Cypriot crisis has rattled close ally Greece, which is locked in talks with creditors over implementing its own bailout programs. Debt inspectors from the European Union and International Monetary Fund are due to return to Greece early next month. "We responded to the need to fully protect depositors of Cypriot banks in Greece and ensure the stability of the Greek banking system," Piraeus Bank chairman Michalis Sallas said. 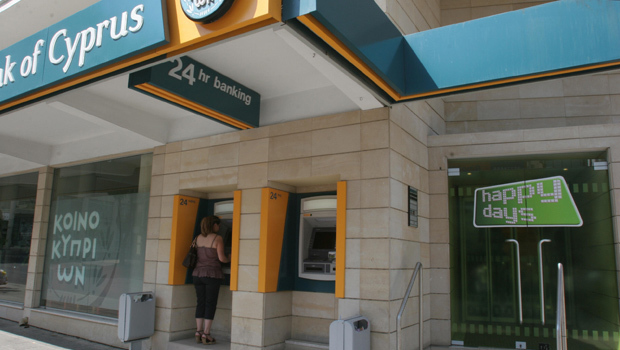 The two Cypriot banks have combined deposits of around $15.5 billion and loans worth some $24.6 billion in Greece. They employ some 4,300 staff in a combined network of nearly 300 branches. Piraeus bank shares were up 20.21 percent Friday in anticipation of the deal, as the Athens Stock Exchange closed up 0.61 percent at 930.53. Greek authorities have issued repeated public assurances that Greek bank deposits are safe - a pledge made again Friday by Finance Minister Yannis Stournaras. "We are working day and night to both absolutely guarantee the stability of the banking system and to find a lasting solution for Cyprus' economy and its citizens," he said.